We’re calling it: Florals are having a major moment. And by this we don’t mean the quintessential floral prints on everyone’s summer OOTDs! In fact, it’s the other way around. Keep your outfit as simple as possible, in muted hues or in a single color, and go “wild” by choosing an unapologetically OTT flower-filled background. It doesn’t sound like a brand-new trick, we know, but it seems like posing against (or in the middle) of a field of flowers is *still* a thing right now, as spotted on the IG grids of top bloggers and our favorite celebrity style stars. It’s an easy and effective way to make your otherwise boring, plain Jane outfit look a tad more interesting. The best part? You can easily take photos in your backyard garden or by your neighbor’s blooming shrubs. Sit in the middle of a flower field. This trick apparently isn’t exclusive to feminine-product commercials anymore—come on guys, it’s 2019! 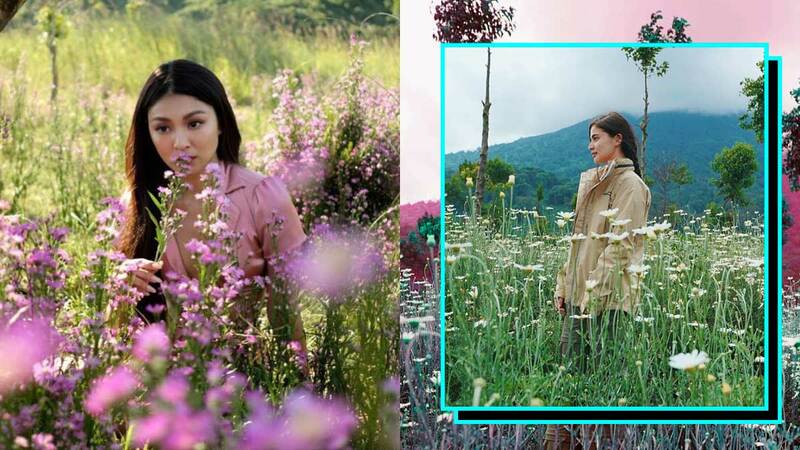 In her latest MV, Nadine Lustre matches her lilac lewk with her surroundings (or is it the other way around?) and ends up looking bomb as always. Anne Curtis poses in the middle of a flower field to show us how breathtakingly majestic the view from her Africa trip is! And we get a sneaky peek into her travel OOTD while at it, too… Love her coat! Go ahead, lie down on a field of flowers! Bela Padilla assures us that it’s totally fine to wear an off-white dress and lie on the grass. The result? A dreamy OOTD shot that’s totally worth the risk and effort! Pro tip: Mix and match your outfit with the color of the flowers. Tricia Gosingtian’s sheer navy blue dress is the perfect contrast to the rosy red beauties behind her. Agree? Reach a Camille Co-level of ~*extra*~ and totally dress up for the garden scene of your dreams! The oranges, browns, and reds that surround this indoor garden definitely give off autumn vibes, and as always, Camille Co enters right on cue in her yellow, leaf-print, ruffled dress. If you can’t beat 'em, join 'em! Sofia Andres couldn’t resist plucking a flower off the shrub and tucking one behind her ear. We think it was just the exact accessory she needed to add oomph to her look! Plain white dress? Floral background? Like totally! Yassi Pressman prepared lotsa layouts for her very floral spread. Love them all! Not a flower field in sight? Karylle finds a way. She sits in the middle of colorful flower boxes and—voila!—her casual look is instantly elevated. Best part: Her violet sweater coincidentally matches the flowers! Flowery spots are at once Heart’s happy place and preferred OOTD location. We think it really suits her aesthetic! When indoors, find the next best thing to a floral garden. Here, Miss U 2018 Catriona Gray settles down in a floral-filled nook that makes her neutral-toned suit look even more elegant. Flower power!